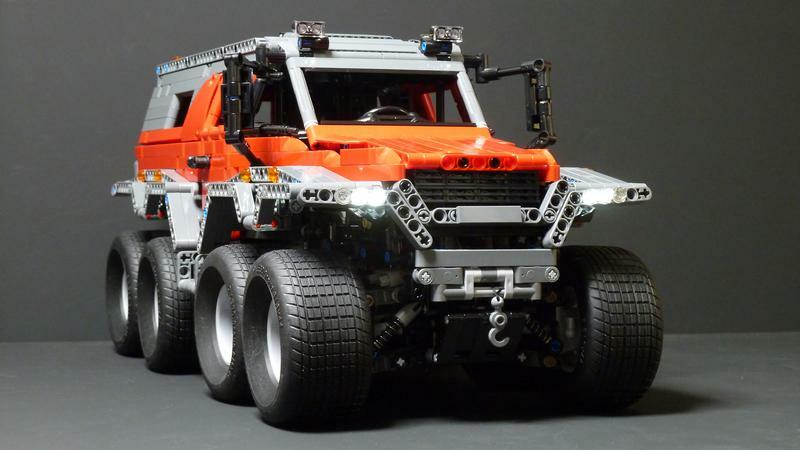 Since TLG released 76023, I had been waiting for affordable Technic set which includes so-called Tumbler Tires. So I jumped at 42050 Drag Racer. I also bought some extra tires separately, then revived old project which had failed three years ago. which can go through almost any kind of terrain. It has three steering modes and can scale 45-degree incline. On top of that it is amphibious. Seeing pictures and videos, I instantly fell in love with it. When I started the project, I was too ambitious to realize all features above. 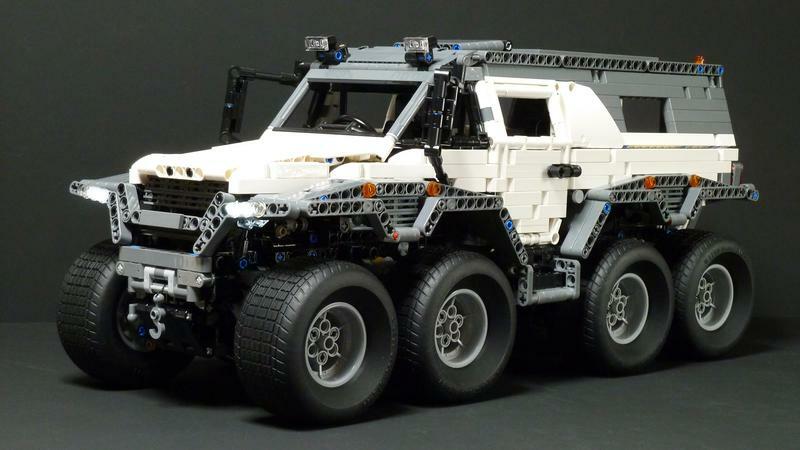 Sadly I could not build even steering mechanism while keeping all wheel drive and independent suspension. 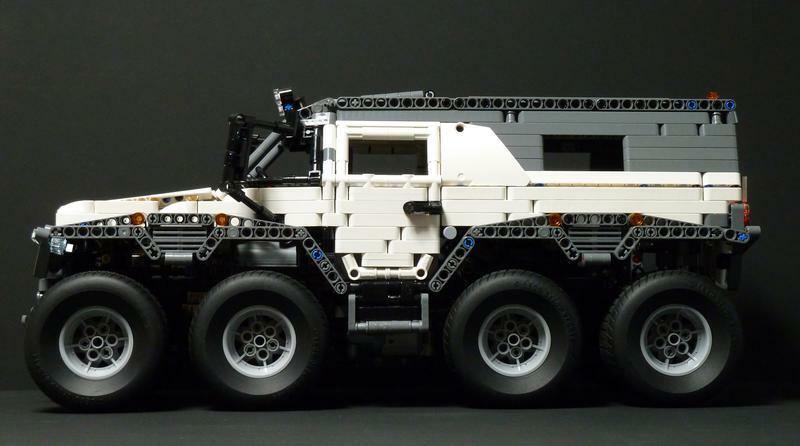 So I changed the project to building another 8x8 vehicle. It ended up as my Tatra 813 Trial Truck, but that is another story. Two months ago, I suddenly came up with an idea that enables both normal AWS and crab steering. In the case of four-wheeler, you can do it by switching rotation of second Servo motor for rear axle. 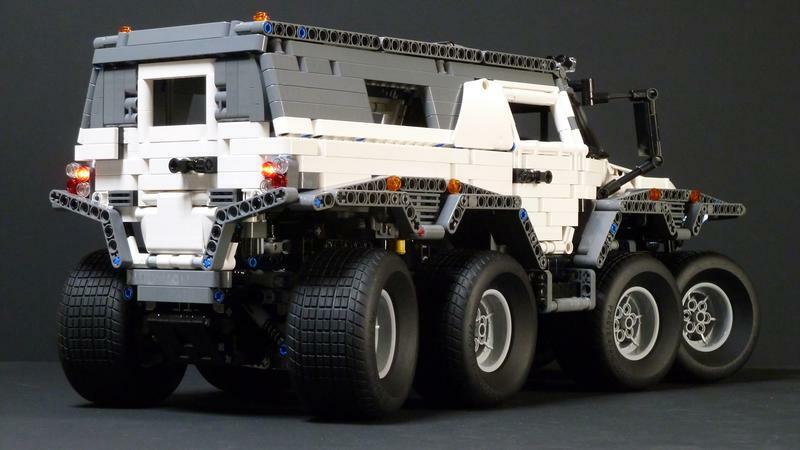 But in eight-wheeler like Shaman, you should change turning radius of second and third axle. In normal mode, the steering angle of inner two axles is smaller than outer axles. But in crab mode, all axles should be steered at the same angle. This is the basis of steering idea. I used the way of fixing/moving pivot of steering linkage. A: There are two 7L steering racks connected to 7L beams. Front rack is connected in the middle of beam, rear is one stud backwards. Both ends of beams are connected to steering arms of each axle. B: In normal mode, rear rack is fixed by 12T bevel gear. So the fixed pivot of 7L beam is its 5th pin hole. Which makes front end of beam moves twice as rear end does. That means the steering angle of 1st axle is twice as 2nd axle. C: In switching crab mode, 12T bevel gear moves one stud forward and fix front rack. Fixed pivot is 4th pin hole of beam. Which makes both ends of beams move equally. That means the steering angle of 1st axle is the same as 2nd axle. And there is one more twist. D: I put main steering rack (moved by pinion gear) on one stud forward of 7L beam's front-end (which means 9L beam’s front-end). Seeing from the pivot point, this rack is connected to farther than the point of front steering arms connected. So front steering arms always move slightly shorter than main rack does. When Servo fully turns 90 degrees, pinion gear moves the rack in one stud sideways. Steering arms move less than one stud. This was necessary for keeping CV joint (connected to steering hub) rotate smoothly even when fully steered. First of all, this MOC is NOT amphibious. It is too heavy to float. 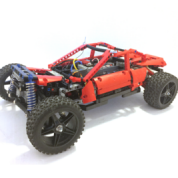 And because of driving motors of low position, chassis is not waterproof at all. So it is not recommended driving it through even shallow water pool. My aim was to achieve decent crawling capability. But I had to lower the bar because there was no room left for portal/planetary hub reduction. 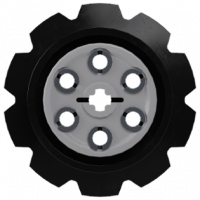 Without them, heavy load from 81mm tires directly goes to 12T half bevel gears. First attempt was using two XL motors geared 25:9. I put each motor for left/right side of axle. The result was unsatisfied. 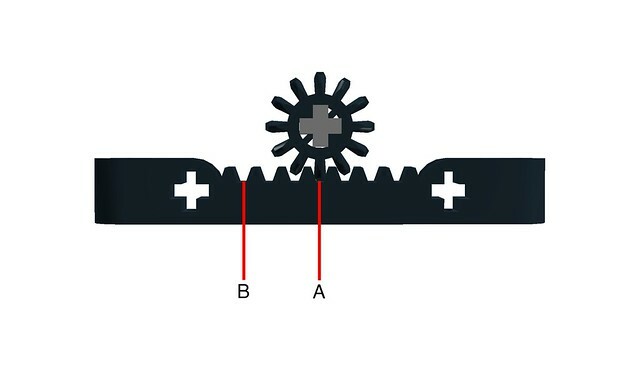 Even when climbing over small obstacles, bevel gears often slipped and got damaged. So I replaced them with four L motors geared 3:1. Each one drives a pair of half axles. Thanks to their good speed and smaller torque, new drivetrain proved to be more reliable. Although bevel gears were still slipping a bit, I accepted overall performance. The picture above shows two L motors for driving right side of axles. The power functions switch for changing rotation of rear Servo motor is synchronized with moving steering pivot mechanism. 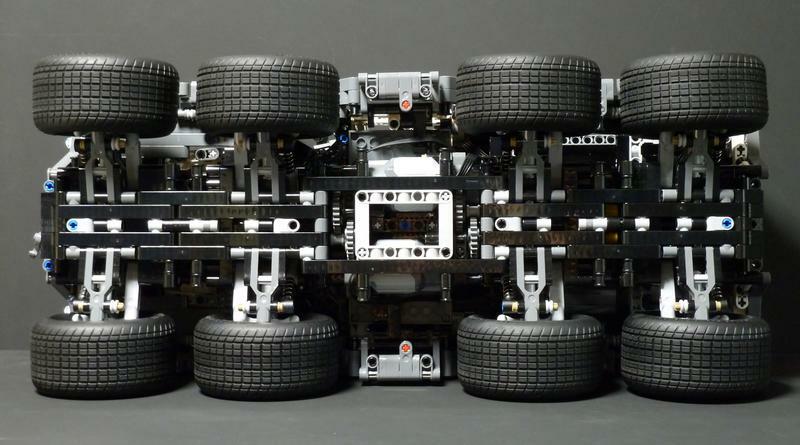 In crab mode, rear 4 wheels steer opposite the same direction as front wheels. As always I used few of non-Technic parts. Big roof tile was used for saving weight, curve slope parts were better choice for filling the gap. LBG axles sticking out the roof are visible indicator for steering mode. They are mechanically connected to switching mechanism. In the video you can see how they work. Building it in red is possible by using red parts instead of white. I hope you will enjoy building! Amazing job, it performs great. 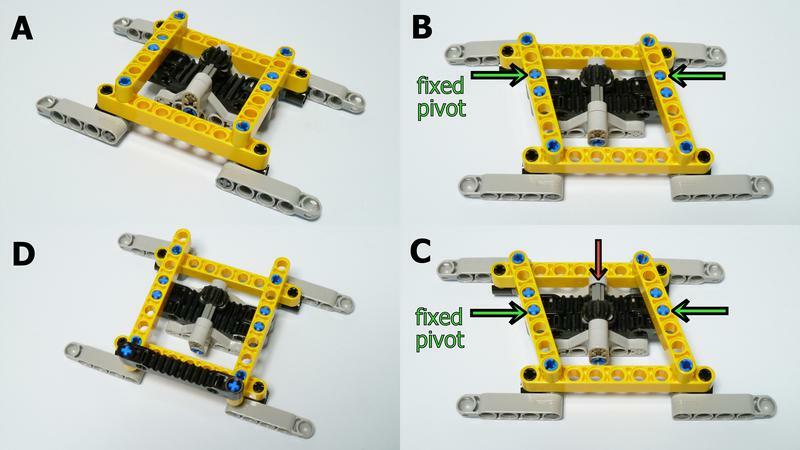 Interesting and simple mechanism for transferring between normal and crab steering. Wow, it looks great with those tires! Currently that are my favorite tires, the ones you used. The looks of those are phenomenal! Like already said on youtube, awesome MOC! Your works amaze me every time! I was looking to an application of this wheels, you found the perfect one! I love these tires, too. 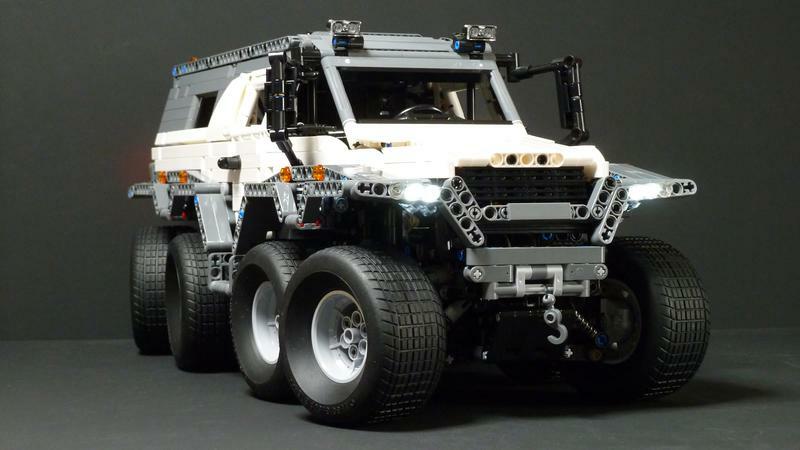 Seems they rather suit ATV MOCs than trucks/lorries.The problem was that their width occupies nearly half of chassis space. I had to build whole chassis in 9 stud width. It was hard to put eight motors and steering mechanism together in that space. And very intelligent mechanism for the crabe steering! Outstanding as always, clean and proficient, but can it climb 45 degrees? Just wow. 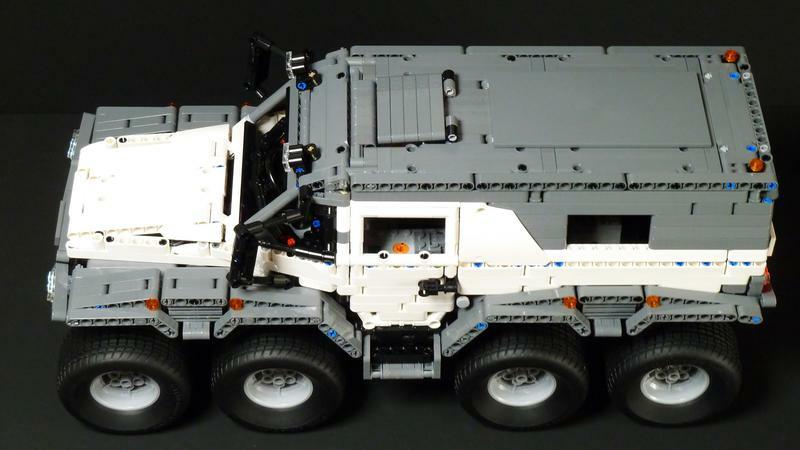 One more vehicle that goes on the build list! Very well done! I am really curious to see the steering mode switch in action. This will be very interesting. Top class as always! Looks and functions just as it should. That filming location is pretty great too with its "clean" rocky surfaces to test out the suspension. That's quite a few tumbler tyres, wow! Genius design for the steering! When Servo fully turns 90 degrees, pinion gear moves the rack in one stud sideways. 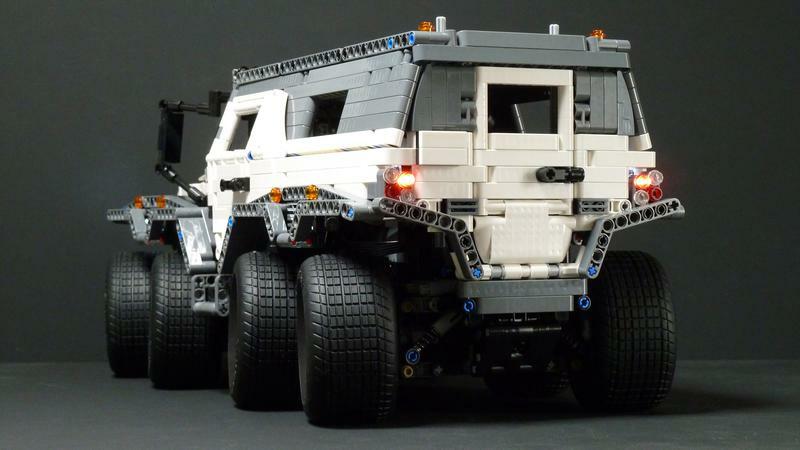 Very clever mechanism, I like the tires too, I have eight but not with me yet . I can imagine this! Just for fun I installed these tires on my KrAZ and made me realize these tires are wide indeed. 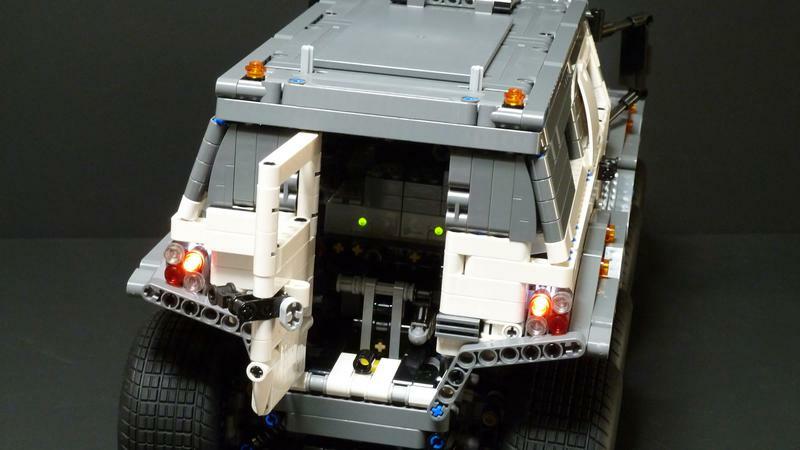 You having the chassis build in 9 studs is cool and impressive the same time... I can imagine squeezing in the motors in that limited space isn't easy at all...but you did...!!! I already had lots of problems with 13 studs...I can't imagine at 9! Beauty and the beast. All in one. Best use of those tires so far. From the video it appears to climb just fine. Perhaps not 45 degrees, but close to it. Also, with relative ease. I would not be surprised if it can climb 45 degrees. I still can not decide if I love it or not appearance-wise... but ingenious steering (+ chassis) solution and proper scale modeling! can it climb 45 degrees? It can't climb 45 degrees without using winch. To protect the drivetrain, I reduced the torque by using L motors instead of XL. Still I heard the sound of bevel gears slipping when shooting last part of the video. You are right. I should have said "roughly" one stud. There is always minimal gap between pinion and rack gear. It causes little play in rack movement. 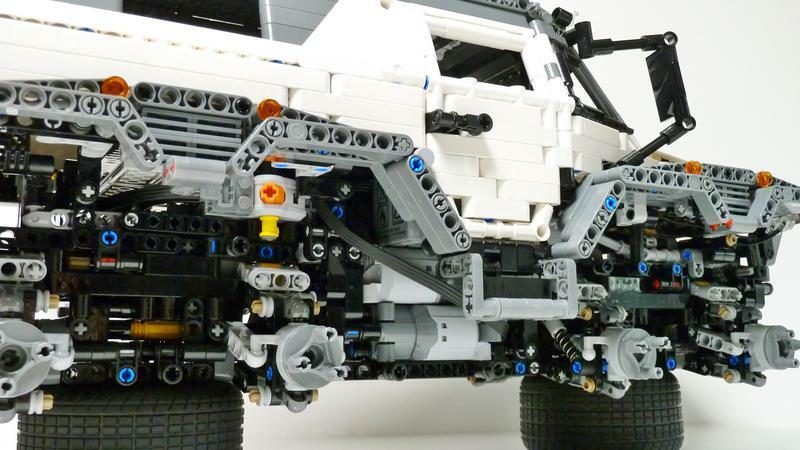 Also the move of steering linkage is limited by surrounding parts. So the rack doesn't move more than one stud in this MOC. I'm not satisfied with the balance of body and fenders. That's because I couldn't make thinner fenders using Technic parts. 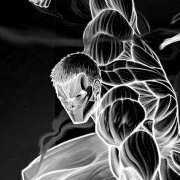 As a scale model, the body should have wider appearance. Looks awesome! Performance is pretty good for something that size, especially with the width of the drivetrain. 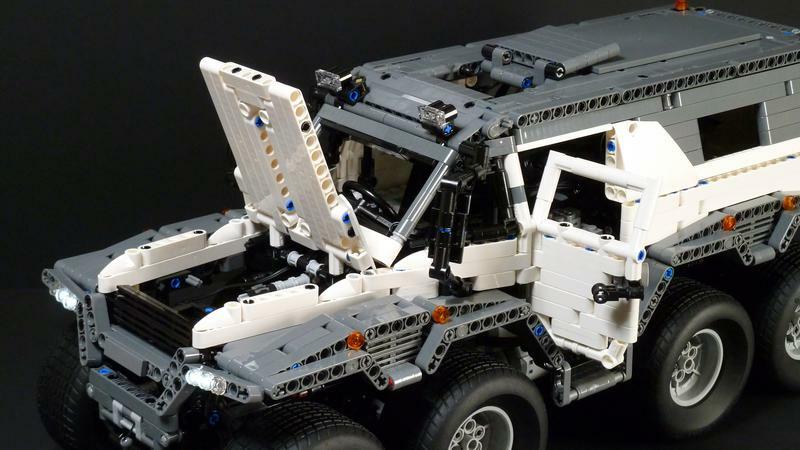 I will be building this as soon as there are instructions! Will the parts list be released before the instructions? Impressive model and a very clever steering mechanism. And again a very smooth body design. What a great looking build! That it can switch to crab steering is VERY cool.